Ed Hamberger, the outgoing President and CEO of the Association of American Railroads (AAR), guided America’s freight rail industry through two decades of change and uncertainty. A hallmark of his leadership style: An emphasis on trust and partnership — and consistently delivering win-win solutions. This month, he will be presented with the 2018 Railroad Innovator Award, a recognition of the innovative and pivotal role he played in advancing the industry’s interests in Washington, DC. We sat down with him to talk about the changing face of railroads, his most memorable moments and what the future has in store. If you could use one word to describe your tenure at AAR, what would it be? Change. The rail industry of today is very different from the industry of two-plus decades ago. Our business has changed. Our country has changed. And our technology is changing at an ever-faster pace. The most obvious is certainly the changes associated with the goods we move, which are a direct result of broader economic and policy trends. 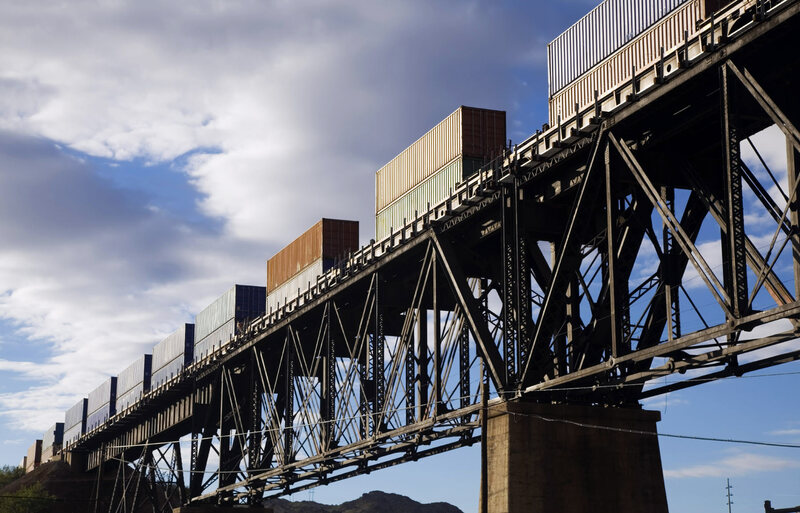 We’ve seen an increase in intermodal traffic as a result of expanded international trade while our mix of energy products has shifted, with a decline in coal traffic and fluctuations in crude oil and even frac sand. Our entire country changed on 9/11 — and railroads were no exception. In the post-9/11 era, there is a heightened focus on national security and terrorist threats. I am proud of the protective measures we took in the aftermath of 9/11, and that we continue to set a high bar for protecting our network through a comprehensive industry-wide plan that addresses both physical and cyber threats. Finally, technology and automation are forces of change that will shape the entire transportation industry, and railroads are actively working to harness that power to improve safety and efficiency. Railroads have always been innovators, and change is part of the natural evolution of the industry. Change is inevitable. My challenge at AAR was how best to manage this change, embrace it and channel it to make our industry stronger. What’s the key to navigating this change? Trust and partnership. Solutions to big challenges only happen when everyone is at the table. When I first joined AAR in 1998, I was asked to have dinner with the Board of Directors for the American Short Line and Regional Railroad Association (ASLRRA). After the dinner, ASLRRA President Bill Loftus shook my hand and thanked me for coming, noting that they had not eaten dinner with an AAR President in ten years. I was dumbstruck — we were all in the same industry, and even in the same building. That one experience really cemented for me the importance of inclusivity and collaboration. So, I have actively worked to bring all our rail stakeholders together — from railroad companies to Amtrak, rail labor and rail shippers — to create a partnership that benefits the entire industry and the customers we serve. What stands out to you as the best example of this collaborative approach? When I came into this job, there were several “truths” of the rail industry. One of those was that Chicago was always going to be a problem. Each day 1,300 freight and passenger trains move through Chicago, carrying 25% of the country’s freight traffic. Chicago sneezes and the entire network catches a cold! Unsnarling this tangle of rail lines and building a fluid system seemed an almost insurmountable challenge. Yet together, the rail industry — including six Class I railroads, Amtrak and Metra, Chicago’s commuter rail system — and federal, state and local governments came together to establish the Chicago Region Environmental and Transportation Efficiency (CREATE) Program — an unprecedented public-private partnership. The recent announcement of a $132 million federal grant for the 75th Street Corridor Improvement Project, which aims to eliminate one of the most congested points in the U.S. rail network, is a recognition of the idea that when people come together, great things can happen. Thanks to CREATE, what was once the biggest chokehold in America is becoming a more fluid network that will meet tomorrow’s freight needs, add 44,000 jobs and generate $31.5 billion in economic benefits over the next 30 years. Let’s switch gears for a minute and talk about the future. What do you think the future holds for this industry? I think we can also anticipate a drastically different freight transportation industry across the board — with new definitions of competition. What does a world look like with autonomous and platooning trucks? What about a viable network of drones to deliver freight? What do our rail jobs look like in 10 or 20 years? In some cases, technology has the potential to redefine our workforce and create whole new job categories, and it will be up to us to find solutions that benefit the industry, our customers and our workers. You’ve worked in and with government throughout your career. How do you think government is positioned to help railroads going forward? Government needs to recognize that the future of our industry is, in many ways, tied to its past. Economic deregulation gave railroads the flexibility to compete and the ability to invest. Keeping that smart regulatory structure intact will ensure that railroads have the resources necessary to compete in the future and continue delivering for our country. Today, we’re seeing more and more competition in transportation, overall. Government needs to level the playing field to ensure that trucks and rail are on equal footing. Further, federal regulations should encourage innovation, not discourage it. Greater safety and efficiency are not only good for our business, they are good for the country. Railroads need the regulatory flexibility to achieve those next milestones through development and deployment of technology. We just celebrated Thanksgiving. What in your career have been most grateful for? I work for an industry that people love. Everyone has a grandparent who worked for the railroads; it truly is an industry that helped shape America as we know it today. I remember being a kid in Sinking Spring, Pennsylvania and the railroad whistle was a part of life. Little did I know how large a part of my life it would become. I remember running into Senator Mitch McConnell one day and his first question to me was, “How are the railroads?” I knew then that I was “the railroad guy,” and had carved out a small place in the long history of a great American industry. For that, I will always be grateful. AAR President & CEO, Ian Jefferies on how 21st-century thinking and technology are transforming the industry that helped build this nation. One thing you don’t have to pay for? The maintenance, upkeep and modernization of America’s 140,000-mile rail network. AAR’s SVP of Government Affairs, Adrian Arnakis, discusses how America’s railroads — not taxpayers — invest in rail’s technologically advanced infrastructure, spending an average of $25 billion annually. Thanks in part to ongoing rail investments in infrastructure, operations, technology and community preparedness, FRA data show recent years have been the safest in the history of the rail industry.